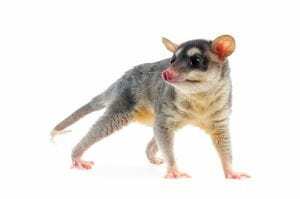 Are Opossums Dangerous to Humans and Pets? Opossums are one of the most unique animals to grace the Maryland area. They are widely known, but rarely seen due to their nocturnal nature, and are hardly happy to socialize with humans, preferring to stay hidden and only venture out when they think they will not be seen or messed with. As the animals are rarely seen, few people know whether they are in any danger when they come across an opossum. Opossums are generally not a problem for humans, as the animals subsist on a diet made up of mostly small rodents, insects, worms, vegetables, berries and nuts. For the most part, seeking out these foods does not bring opossums into contact with humans, but the creatures also have an affinity for pet food and bird seed. As nocturnal creatures, opossums will seek out food at night, but this can bring them into contact with a pet which has been left outside for the night and may still have food with it. When it comes to pets, opossums are still not likely to attack. Instead, they prefer to bare their teeth and hiss, in an effort to scare off the opposing (and likely larger) animal. The smaller the animal it comes across, the more likely it is that an opossum will attack, because the creatures are smart enough to know which fights they have a high chance of winning. Opossums are less of a threat to dogs, due to their size, but are often known to attack cats instead. As such, when opossums come across a human or a big dog, they may pull the classic move of playing dead. They will only stay in such a state for a few minutes, but will hiss and try all their moves if playing dead, which is often a last resort, doesn’t appear to scare off the larger and more dominant humans. While opossums are unlikely to attack the vast majority of animals, they are a wild creature and are often unsafe to be around due to the potential of carrying a disease. Opossums can carry TB, leptospirosis, coccidiosis, tularemia, spotted fever and are also a host animal to ticks, lice, mites and fleas, all small insects which have the potential to wreak havoc on a home. There is also a very small, but possible, potential for opossums to have rabies as well. If you notice an opossum near or on your property, call the experts at Shumaker Animal Control to deal with the problem for you. Our experienced team will take care of the problem in a timely manner, ensuring that your home and pets are not in any danger. Call us at 443-854-8072 or view the online website or fill out our contact form for more information. This entry was posted on Thursday, February 7th, 2019	at 2:26 pm	. You can follow any responses to this entry through the RSS 2.0	feed. Both comments and pings are currently closed.